Thinking of opening a webstore??? Discussion in 'Retail Refillers Forum' started by badger13, Jul 1, 2010. I jumped into the ink cartridge refilling industry right out of college and now after 3 years and 3 different stores and owners I think I have a pretty good understanding of the industry. Just wondering what people thought of the the online webstores offered by Printer Essentials or Copy Techonologies. It all seems far too easy. No inventory, no employees to pay, no renting space, no utility bills . Just go out drum up some business and never even have to touch the cartridge. I'd really love to hear from someone who has actually used one of them or if there is an even better option out there. I'm very curious to hear what others think about this concept. Even though it seems far too easy check the other online competition. Generally these companies just buy huge inventories from Chinese suppliers and resell them wholesale to other sellers. The big problem is though is other Chinese vendors are entirely willing to flood the online market directly with cheap compatibles thus bypassing the smaller retailers. This forces you to lower your margins to compete with Chinese vendors with a direct supplier, you having a wholesale supplier means an extra middleman. The real advantage of refill stores is that you can actually be there to monitor quality control and ensure the cartridges or refills work. That local presence is what drives your business, try to do something online and you're jumping in with the big boys. What equpment are you using in your store? 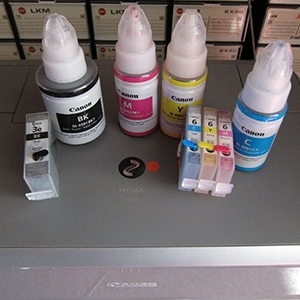 Online stores for printer equipment is not only favors the business owner, but also helps the people to get compatible inkjet cartridges online and saves money on it. The challenge in opening your own web store is actually keeping up with the competition. Some of the brands I have seen have been there for ages already and it would be quite challenging to actually trump them over. I am not saying that this would not be something that you could achieve but in order to do so, you have to be patient and capitalize on openings that you see would benefit you the most. Sure it seems easy, when reading these vendors' offers... but nothing in life comes easy! Trying to compete with the Chinese manufacturers is almost impossible! Not sure where you live but these days most people are trying to save as much money as possible so filling their own used cartridges is the way more and more people will go, apart from the very rich who will just keep replacing the genuine article. I Would check to see the number of people who have previously gone into this business but have then had to close down for various reasons. ie lack of custom. or too much competition.